Recent developments by the Chinese Navy have kicked off a debate within military analyst circles about how the Chinese fleet would fare against the U.S. Navy if a dispute between the two nations ever escalated to the point of war. While most analysts still believe that the U.S. Navy can deploy far superior assets, the People Liberation Army Navy (PLAN) does have many deterrent systems that could effectively create a “zone-of-control” around the South China Sea. In contrast, the U.S. Navy depicts itself as a global force, capable of patrolling any ocean or sea across the globe. To do this effectively, the U.S. fleet operates its own space division that allows the force to create a zone-of-control that extends across the globe. But what space assets under the U.S. Navy’s control allow it to coordinate its actions and project its authority across the globe? Since 2012, the U.S. Navy’s Communications Satellite Program Office has been operating a Mobile User Objective System (MUOS) satellite constellation. MUOS is an Ultra High Frequency (UHF) communication platform that improves the current quality and range of communication connectivity afforded to the U.S. Navy and other branches of the armed forces. To achieve this end, the U.S. Navy launched five geosynchronous satellites into orbit—four that are online, and one that is permanently stationed as a backup—and bound them together with four ground stations and a terrestrial transport network that ensures the system will always be online. 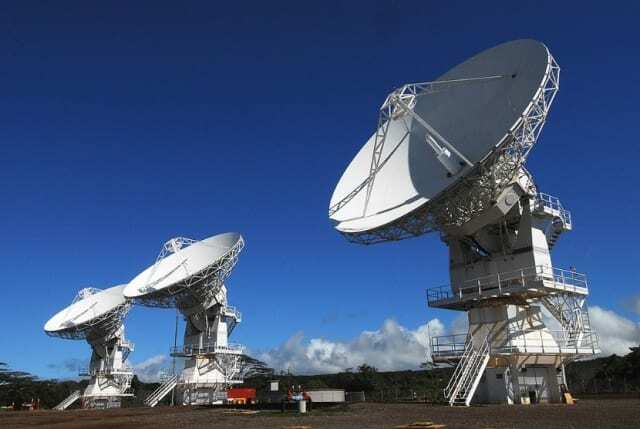 A MUOS ground station in Hawai'i. Four of these stations exist around the globe, and each one helps facilitate high quality, data rich communications to troops operating on the ground. With this infrastructure the U.S. Armed Forces will have access to high quality voice, video and data streams when on the move, making it possible to receive the most accurate intelligence about a scenario no matter their position on the globe. To access the MUOS communication networks, soldiers—in particular the U.S. Marine Corp.—have been equipped with MUOS capable, portable radios. Testing on the MUOS system is currently underway, and the entire MUOS system is expected to be fully operational by the summer of 2019. 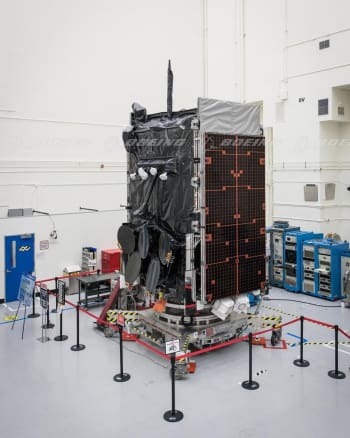 One of nine WGS satellites being assembled in a clean room at a Boeing facility. Each WGS satellite is more than 10 times more capable than its predecessor. In addition to its MUOS network, the U.S. Navy also uses the Wideband Global SATCOM system (WGS) to facilitate all manner of communications. The WGS system is composed of nine separate satellites that each offer 4.875 GHz of instantaneous switchable bandwidth corresponding to a capacity of 2.1 to 3.6 Gbps. To put that in perspective, each 5,987kg orbiter can deliver more than ten times the data capacity of the WGS’ predecessor, the DSCS-3. Beyond voice communications, the WGS constellation supports soldiers on the ground, aircraft running sorties, and helps guide and manage the data being sifted up by the unmanned drones that blanket the planet’s skies. Although many of the U.S. Navy’s space assets spend their lives living in space, one of its most controversial technologies only spends a short time off-world. On the night of February 20, 2008, a non-functioning reconnaissance satellite, the US-193, was limping through space. At approximately 10:26p, EST, the USS Lake Erie launched a SM-3 missile from its deck with the aim to take down the broken satellite. Some moments later the satellite was destroyed, marking the first time the U.S. Navy had intercepted a satellite in orbit from a ground-based platform. 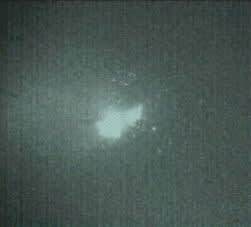 The US-193 moments after it was intercepted by a SM-3 missile fired from the USS Lake Erie. Shortly after detecting the explosion in space, both Russia and China condemned the U.S. actions, and rightfully so. Even though the satellite was U.S. property, its destruction helped litter an already crowded plane of operational orbit, and was seen as a provocative act that threatened the security of both countries’ critical space infrastructure. To this day, it is unknown if the U.S. Navy or any other branch of the U.S. Armed forces has developed a dedicated space system interceptor based on the results of this demonstration, but one would have to assume that somewhere deep in the Department of Defense’s dark budget there’s a few tens of millions being spent on a space weapon of the same or more lethal caliber. While the U.S. Navy has played a crucial role in the development of the U.S. Armed Forces’ space-based infrastructure, one of the first things one realizes is that the U.S. military’s modern structure pays little heed to the delineation of service branches when it comes to technology development, deployment and use. Modern warfighters, whether they are on land, in the air or on the sea, use many of the same tools to coordinate their actions with one another and transform into a more effective fighting force. Although the U.S. does take up a leading role in the development and deployment of space assets and off-world weapons, it does so knowing that all of its efforts are available to any branch of the U.S. Armed Forces, and that coordinated notion makes it possible for the U.S. Navy, and the U.S. military as a whole, to operate a global zone of control that will be hard to match in the near future. Can China’s Navy Match the U.S. Fleet?